Pigment epithelial detachment (PED) is a pathological process in which the retinal pigment epithelium (RPE) separates from the underlying Bruch's membrane.1,2 Although PEDs can develop in a variety of macular disorders, the association with neovascular age-related macular degeneration (nAMD) is notable as a marker of disease severity, progression and, in some cases, resistance to treatment. Clinically, a PED appears as a smooth, dome-shaped subretinal elevation on funduscopy and may be associated with other signs of AMD including drusen, subretinal fluid, hemorrhage or overlying RPE hyperplasia.3 Optical coherence tomography (OCT) features include a uni- or multi-lobed RPE elevation that may be hyporeflective (serous PED) or hyperreflective (fibrovascular PED), and may be associated with a subretinal choroidal neovascular membrane or, more commonly, adjacent subretinal fluid.3 Fluorescein angiography typically shows choroidal neovascularization (CNV) with pooling of subretinal fluid, unless it is obscured by blood or fibrovascular proliferation (FVP). The pathogenesis of PED formation in AMD is incompletely understood, but likely involves penetration of CNV through Bruch's membrane into the sub-RPE space with secondary extravasation of fluid or blood, and an increase in hydrostatic pressure that separates the RPE from the underlying Bruch's membrane.1 Alternatively, idiopathic PEDs may cause disruption in the collagenous zones of Bruch's membrane, which removes an important barrier to CNV that may further exacerbate PEDs.4,5 PEDs are observed in up to 62% of eyes with advanced AMD,6 and approximately 50% of patients with newly diagnosed PEDs will experience significant vision loss (>3 lines) within one year of diagnosis;7 therefore, PEDs serve as important markers of AMD disease severity and progression. Over the years, retina specialists have employed a variety of strategies to treat vascularized PEDs, including anti-VEGF therapy, intravitreal steroids, Verteporfin (Visudyne; Novartis Ophthalmics AG, Bülach, Switzerland) photodynamic therapy (PDT), and laser photocoagulation. Eyes with small or stable PEDs may retain good central visual acuity. Most pivotal AMD clinical trials of anti-VEGF agents (ANCHOR,8 MARINA,9 PIER,10 CATT,11 EXCITE12) have either excluded eyes with large PEDs or, if such eyes were included (i.e. fibrovascular PEDs as part of occult CNV subgroups), sub-analysis of the PED response to treatment was not performed.8-12 Therefore, no clear consensus exists about the management of PEDs in patients with AMD. Several small, largely retrospective studies and case reports have evaluated the efficacy of anti-VEGF agents for the treatment of PEDs in eyes with nAMD, often with conflicting outcomes.13-17 Lommatzsch et al. retrospectively analyzed 328 patients with serous PEDs associated with nAMD and observed a significantly greater improvement in vision and retinal thickness after injection of bevacizumab or ranibizumab than pegaptanib alone or combination treatment with intravitreal triamcinolone acetonide and PDT.16 In contrast, Introini and colleagues reported a retrospective cohort of 50 eyes with PED associated with either CNV or retinal angiomatous proliferation (RAP) treated with intravitreal anti-VEGF therapy (either bevacizumab or ranibizumab).17 At 12-month follow-up, there was a slight decrease in overall visual acuity (baseline logMAR 0.36 to 0.44 for CNV and baseline logMAR 0.58 to 0.78 for RAP), largely related to the high rate of RPE rips despite a decrease in the PED height in many eyes (42% of treated eyes had a decrease in PED height).17 Differences in study results may be due, at least in part, to the heterogeneity of patient populations, varying severities of disease and varying durations of treatment. Prospective clinical data comes from PRONTO,18,19 a two-year open label study which evaluated the efficacy of OCT-guided variable dosing of intravitreal ranibizumab for nAMD (intravitreal ranibizumab was administered in three monthly loading doses followed by as needed [PRN] administration).18,19 Of the 40 patients included in the study, 29 (or 72.5%) had PEDs observed on OCT. 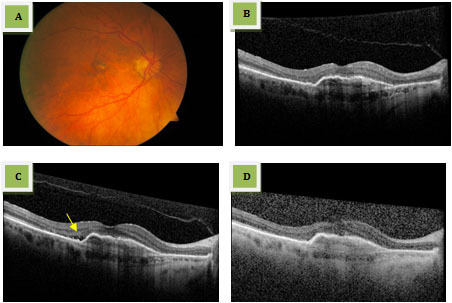 In the overall cohort at 12 months, visual acuity improvement (a mean of 9.3 letters) in response to intravitreal injections of ranibizumab was achieved with an average of 5.6 injections, and OCT demonstrated decreased central retinal thickness and elimination of subretinal fluid and intraretinal cysts in most eyes.19 However, fluid contained within PEDs was significantly more resistant to ranibizumab therapy and the PED height correlated poorly with visual improvement after ranibizumab treatment.19 At three months following initiation of treatment, 37.5% of patients still had PEDs compared to a significantly smaller percentage of patients with retinal cysts and subretinal fluid (7.5% and 2.5%, respectively).19 Overall, results of the PRONTO Study suggest that the presence of subretinal/intraretinal fluid was more important than the presence of PED alone in determining visual acuity response to anti-VEGF therapy in eyes with nAMD. The natural history of RPE tears in nAMD patients with PEDs is unclear. In one retrospective series, the rate of RPE tears in patients with PEDs of all subtypes was 3%,36 while in a prospective series of serous PEDs the rate was 11.9%.7 RPE tears have been reported after the administration of anti-VEGF therapy (including bevacizumab, ranibizumab and pegaptanib,) in 16.8%-26.2% of patients depending on the study and the size and type of PED.17,37,38 Most PED-associated RPE tears appear to occur within several weeks following the first or second anti-VEGF injection. The rate of RPE tears in PEDs treated with PDT may be even higher, with published reports ranging from 13%31 to 40.6%.17 However, many retina specialists believe that this may be an overestimation of the incidence of RPE tears. Large fibrovascular PEDs appear to be at the highest risk for RPE tears with the central height of PED, volume index and presence of subretinal fluid being important predictors of RPE rip.37 In one series, uneven filling on fluorescein angiography associated with central hypofluorescence in the PED and early hyperfluorescence at the PED edge were characteristics of PEDs that developed RPE rip.39 The severity of vision loss appears to correlate with the size and location of the RPE tear. RPE tears that are greater than one disc diameter in size and that involve the fovea are at the highest risk for severe vision loss and are least likely to respond to subsequent anti-VEGF therapy. Conversely, eyes with smaller RPE tears and away from the fovea may have a better prognosis and, if associated with subretinal fluid, may respond favorably to intravitreal anti-VEGF therapy. In summary, PEDs represent an important manifestation of nAMD. RPE tears with associated severe vision loss may complicate the approach to treatment of PEDs. Our experience has been that any new vascularized PED with preserved visual acuity and not associated with intraretinal- or sub-retinal fluid or hemorrhage may be observed with frequent follow-up. Anti-VEGF agents, intravitreal steroids and PDT remain important treatment options for PEDs associated with decreased visual acuity or intraretinal- or sub-retinal fluid. However, further prospective studies are needed to define consensus treatment algorithms for PEDs in order to optimize visual outcomes. 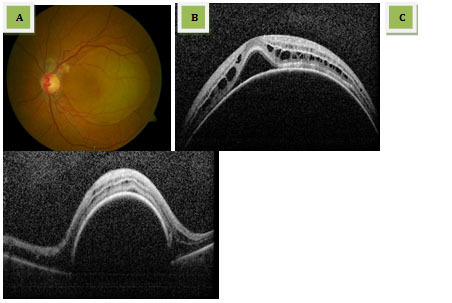 Case 1: 71 year old woman with a history of neovascular AMD presented with a chronic pigmented PED in her right eye (A). She underwent a series of anti-VEGF injections over a six year period (including bevacizumab, ranibizumab and aflibercept at 6-week intervals) with stable vision (20/40) and a stable anatomic appearance of her PED on spectral domain optical coherence tomography (SD-OCT) (B). At one of her visits, the patient declined anti-VEGF injection, and she subsequently developed prompt accumulation of overlying subretinal fluid (C, arrow). She was then treated with intravitreal injection of aflibercept, which was associated with prompt resolution of the subretinal fluid and stable appearance of the PED (D). Case 2: 66 year old Caucasian woman with a history of neovascular AMD and PED in her right eye, presented with a 1-month history of painless vision loss in the left eye with 20/100 vision. Examination showed a large serous PED with associated peripapillary exudates (A). SD-OCT through the fovea (B) and the inferior edge of the PED (C) showed a large dome-shaped serous PED with associated subretinal and intraretinal fluid. 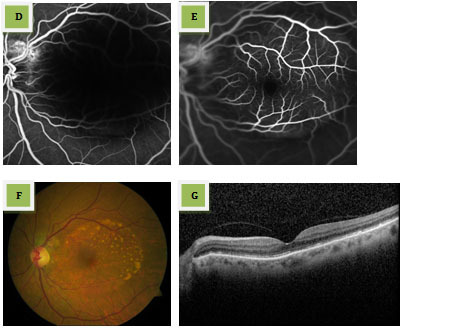 Fluorescein angiography (D, E) shows a large PED with no late leakage or pooling. The patient underwent two consecutive monthly intravitreal injections of aflibercept and, 2 months after initial presentation, had 20/20 vision. Examination demonstrates near complete resolution of the serous PED (F) with some residual exudates and near complete restoration of the foveal contour (G). Case 3: 70 year old woman with a history of non-neovascular AMD presented with worsening vision in her right eye after uncomplicated cataract surgery. Best-corrected visual acuity was 20/100 and examination was consistent with soft drusen (A) and associated serous PED (B, C). The patient underwent serial intravitreal injections of bevacizumab and, four years into her treatment course, developed a RPE rip (D). An area of rolled up hyperpigmented RPE is juxtaposed to the lighter pigmented area with no RPE (E). SD-OCT clearly shows abrupt discontinuity of the RPE layer at the site of the rip (F, yellow arrow) with inverse shadowing over the area of no RPE (F). Reference(s): 1. Gass, J. D. Serous retinal pigment epithelial detachment with a notch. A sign of occult choroidal neovascularization. Retina. 4, 205-220 (1984). 2. Gass, J. D. Pathogenesis of tears of the retinal pigment epithelium. Br J Ophthalmol. 68, 513-519 (1984). 3. Pepple, K. & Mruthyunjaya, P. Retinal pigment epithelial detachments in age-related macular degeneration: classification and therapeutic options. Seminars in Ophthalmology. 26, 198-208, doi:10.3109/08820538.2011.570850 (2011). 4. Marshall, G. E., Konstas, A. G., Reid, G. G., Edwards, J. G. & Lee, W. R. Collagens in the aged human macula. Graefes Arch Clin Exp Ophthalmol.. 232, 133-140 (1994). 5. Green, W. R., McDonnell, P. J. 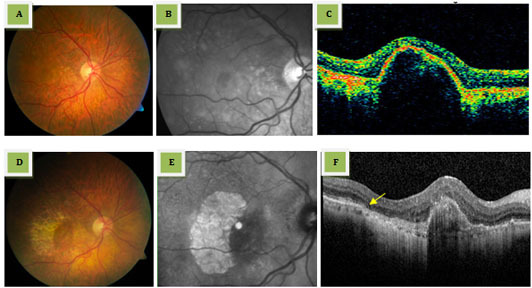 & Yeo, J. H. Pathologic features of senile macular degeneration. Ophthalmology. 92, 615-627 (1985). 6. Coscas, F., Coscas, G., Souied, E., Tick, S. & Soubrane, G. Optical coherence tomography identification of occult choroidal neovascularization in age-related macular degeneration. Am J Ophthalmol. 144, 592-599, doi:10.1016/j.ajo.2007.06.014 (2007). 7. Pauleikhoff, D. et al. Pigment epithelial detachment in the elderly. Clinical differentiation, natural course and pathogenetic implications. Graefes Arch Clin Exp Ophthalmol. 240, 533-538, doi:10.1007/s00417-002-0505-8 (2002). 8. Brown, D. M. et al. Ranibizumab versus verteporfin for neovascular age-related macular degeneration. N Engl J Med. 355, 1432-1444, doi:10.1056/NEJMoa062655 (2006). 9. Rosenfeld, P. J. et al. Ranibizumab for neovascular age-related macular degeneration. N Engl J Med. 355, 1419-1431, doi:10.1056/NEJMoa054481 (2006). 10. Regillo, C. D. et al. Randomized, double-masked, sham-controlled trial of ranibizumab for neovascular age-related macular degeneration: PIER Study year 1. Am J Ophthalmol. 145, 239-248, doi:10.1016/j.ajo.2007.10.004 (2008). 11. Martin, D. F. et al. Ranibizumab and bevacizumab for neovascular age-related macular degeneration. N Engl J Med. 364, 1897-1908, doi:10.1056/NEJMoa1102673 (2011). 12. Schmidt-Erfurth, U. et al. Efficacy and safety of monthly versus quarterly ranibizumab treatment in neovascular age-related macular degeneration: the EXCITE study. Ophthalmology 118, 831-839, doi:10.1016/j.ophtha.2010.09.004 (2011). 13. Arora, S. & McKibbin, M. One-year outcome after intravitreal ranibizumab for large, serous pigment epithelial detachment secondary to age-related macular degeneration. Eye (Lond). 25, 1034-1038, doi:10.1038/eye.2011.115 (2011). 14. Arias, L. Treatment of retinal pigment epithelial detachment with antiangiogenic therapy. Clin Ophthalmol. 4, 369-374 (2010). 15. Ritter, M. et al. Effect of intravitreal ranibizumab in avascular pigment epithelial detachment. Eye (Lond). 24, 962-968, doi:10.1038/eye.2009.265 (2010). 16. Lommatzsch, A. et al. Serous pigment epithelial detachment in age-related macular degeneration: comparison of different treatments. Eye (Lond). 23, 2163-2168, doi:10.1038/eye.2008.425 (2009). 17. Introini, U. et al. Vascularized retinal pigment epithelial detachment in age-related macular degeneration: treatment and RPE tear incidence. Graefes Arch Clin Exp Ophthalmol. 250, 1283-1292, doi:10.1007/s00417-012-1955-2 (2012). 18. Lalwani, G. A. et al. A variable-dosing regimen with intravitreal ranibizumab for neovascular age-related macular degeneration: year 2 of the PrONTO Study. Am J Ophthalmol. 148, 43-58 e41, doi:10.1016/j.ajo.2009.01.024 (2009). 19. Fung, A. E. et al. An optical coherence tomography-guided, variable dosing regimen with intravitreal ranibizumab (Lucentis) for neovascular age-related macular degeneration. Am J Ophthalmol. 143, 566-583, doi:10.1016/j.ajo.2007.01.028 (2007). 20. Photodynamic therapy of subfoveal choroidal neovascularization in age-related macular degeneration with verteporfin: one-year results of 2 randomized clinical trials--TAP report. Treatment of age-related macular degeneration with photodynamic therapy (TAP) Study Group. Arch Ophthalmol. 117, 1329-1345 (1999). 21. Verteporfin therapy of subfoveal choroidal neovascularization in age-related macular degeneration: two-year results of a randomized clinical trial including lesions with occult with no classic choroidal neovascularization--verteporfin in photodynamic therapy report 2. Am J Ophthalmol. 131, 541-560 (2001). 22. Larsen, M. et al. Verteporfin plus ranibizumab for choroidal neovascularization in age-related macular degeneration: twelve-month MONT BLANC study results. Ophthalmology. 119, 992-1000, doi:10.1016/j.ophtha.2012.02.002 (2012). 23. Kaiser, P. K. et al. Verteporfin plus ranibizumab for choroidal neovascularization in age-related macular degeneration: twelve-month results of the DENALI study. Ophthalmology. 119, 1001-1010, doi:10.1016/j.ophtha.2012.02.003 (2012). 24. Koh, A. et al. EVEREST STUDY: Efficacy and Safety of Verteporfin Photodynamic Therapy in Combination with Ranibizumab or Alone Versus Ranibizumab Monotherapy in Patients with Symptomatic Macular Polypoidal Choroidal Vasculopathy. Retina. 32, 1453-1464, doi:10.1097/IAE.0b013e31824f91e8 (2012). 25. Pece, A., Isola, V., Vadala, M. & Calori, G. Photodynamic therapy with verteporfin for choroidal neovascularization associated with retinal pigment epithelial detachment in age-related macular degeneration. Retina. 27, 342-348, doi:10.1097/01.iae.0000239253.78495.8c (2007). 26. Coscas, F., Stanescu, D., Coscas, G. & Soubrane, G. [Feeder vessel treatment of choroidal neovascularization in age-related macular degeneration]. J Fr Ophtalmol. 26, 602-608 (2003). 27. Axer-Siegel, R. et al. Photodynamic therapy for occult choroidal neovascularization with pigment epithelium detachment in age-related macular degeneration. Arch Ophthalmol. 122, 453-459, doi:10.1001/archopht.122.4.453 (2004). 28. Gamulescu, M. A., Framme, C. & Sachs, H. RPE-rip after intravitreal bevacizumab (Avastin) treatment for vascularised PED secondary to AMD. Graefes Arch Clin Exp Ophthalmol. 245, 1037-1040, doi:10.1007/s00417-007-0551-3 (2007). 29. Subramanyam, A., Phatak, S. & Chudgar, D. Large retinal pigment epithelium rip following serial intravitreal injection of avastin in a large fibrovascular pigment epithelial detachment. Indian J Ophthalmol. 55, 483-486 (2007). 30. Gelisken, F., Inhoffen, W., Partsch, M., Schneider, U. & Kreissig, I. Retinal pigment epithelial tear after photodynamic therapy for choroidal neovascularization. Am J Ophthalmol. 131, 518-520 (2001). 31. Pece, A., Introini, U., Bottoni, F. & Brancato, R. Acute retinal pigment epithelial tear after photodynamic therapy. Retina. 21, 661-665 (2001). 32. Gass, J. D. Retinal pigment epithelial rip during krypton red laser photocoagulation. Am J Ophthalmol. 98, 700-706 (1984). 33. Thompson, J. T. Retinal pigment epithelial tear after transpupillary thermotherapy for choroidal neovascularization. Am J Ophthalmol. 131, 662-664 (2001). 34. Yeo, J. H., Marcus, S. & Murphy, R. P. Retinal pigment epithelial tears. Patterns and prognosis. Ophthalmology. 95, 8-13 (1988). 35. Bressler, N. M., Finklestein, D., Sunness, J. S., Maguire, A. M. & Yarian, D. Retinal pigment epithelial tears through the fovea with preservation of good visual acuity. Arch Ophthalmol. 108, 1694-1697 (1990). 36. Hartnett, M. E., Weiter, J. J., Garsd, A. & Jalkh, A. E. Classification of retinal pigment epithelial detachments associated with drusen. Graefes Arch Clin Exp Ophthalmol. 230, 11-19 (1992). 37. Chan, C. K. et al. Optical coherence tomography-measured pigment epithelial detachment height as a predictor for retinal pigment epithelial tears associated with intravitreal bevacizumab injections. Retina. 30, 203-211, doi:10.1097/IAE.0b013e3181babda5 (2010). 38. Kook, D. et al. [Retinal pigment epithelial tears after intravitreal injection of bevacizumab for AMD. Frequency and progress]. Ophthalmologe. 105, 158-164, doi:10.1007/s00347-007-1561-6 (2008). 39. Coscas, G., Koenig, F. & Soubrane, G. The pretear characteristics of pigment epithelial detachments. A study of 40 eyes. Arch Ophthalmol. 108, 1687-1693 (1990).